SapphireOne is an Australian company distributing globally providing an all-inclusive software application for managing Enterprise Resource Planning (ERP), Contact Relationship Management (CRM), Document Management System (DMS). These offerings consist of a standalone Single User application named Sapphire, our Client Server application named SapphireOne and our Sapphire Web Pack solution. With our clients established globally, SapphireOne has been providing business freedom since 1986. Research and Development is our focus, since our launch in 1986 we have invested over $200 million in R&D. We provide version updates for download from our SapphireOne SFTP on a weekly basis. We keep in step with technology, taking advantage of developments and improvements in operating systems and other technologies. Our relationship with our clients is unique. We work closely with our clients and actively encourage ideas for innovation. Our clients have direct access to our development team via our tracking notes, we have TeamViewer conference calls with clients dedicated to brain storming future software development and demonstrating new features within the application. We pride ourselves on supporting our clients’ businesses as they grow from a Sapphire single user environment as a startup venture, to major global enterprises deploying SapphireOne client server application and Sapphire Web Pack. Our software suite is highly scalable, with the ability to support unlimited users concurrently. We readily adapt to meet the changing requirements brought on by business expansion. Our relationship with our clients is unique. We hold ourselves accountable to the highest standard in honesty, integrity, trust and transparency within our organisation and when interacting with our Sapphire and SapphireOne clients. We provide equal opportunity to all employees instead of utilising personal preference or physical characteristics. We base our employment decisions on merit, experience and potential. We are there every step of the way during our client’s SapphireOne implementation to ensure processes are followed. Any security vulnerabilities are identified and handled immediately. SapphireOne Pty Ltd (“SapphireOne”) understand privacy is important to you. We are committed to complying with the National Privacy Principles (“NPPs”) contained in the Privacy Act 1988. We have years of experience bridging the gaps between different cultures and business traditions. SapphireOne employees treat individuals with respect and dignity without regard to race, ethnic background, age, gender identify or any other characteristic prohibited by federal, state or local law. We keep ourselves up to date with current standards and provide two major software releases per year. We also supply on a weekly basis, version updates to download from our SapphireOne SFTP. As a true Multi Company ERP Accounting Software Solution, SapphireOne is built to handle unlimited number of companies that can sit within a different tax jurisdiction, have their own financial year ends and trade in their own local currency. The relationship with our client is unique. We work together as a team and customer satisfaction is always our number one priority. "Like a human body, the database is the brain and the functionality is the backbone supporting the whole enterprise"
John Adams, CEO, and his team attended the 4th Annual Australian FinTech Awards. These awards celebrated the achievements of dynamic people, entrepreneurs, innovators and businesses comprising the fintech sector. 4D’s v17 beta has been internally deployed and tested for a couple of weeks. We are pleased to announce there are no detected issues. Increased performance for tasks such as payroll, tax reports, etc. We are very excited & eager to deploy v17, ASAP. SapphireOne has been assessed and certified by Compass Assurance Services for ISO 27001:2013 Information Security Management System. The scope of certification covers that SapphireOne develop, implement, train, maintain and support an enterprise resource management application according to the Statement of Applicability. Bondi Blue is the demonstration company data file we use for training purpose. Sapphire Bondi Blue is now another trademark of SapphireOne Pty Ltd.
29th November 2017 – SapphireOne has incorporated the new ATO requirements regarding SBR2 and has been whitelisted by ATO in November 2017. 30th June, 2017 – Sapphire Custom Web Pack has streamlined stocktaking for Frutex Australia on the last day of financial year. 60,000 square metres of Stocktaking was conducted by 45 people in 1 day by Frutex Australia with Sapphire Custom WebPack. In May 2017, Justice Bromwich in the Federal Court of Australia made orders restraining Sapphire Systems Pty Ltd from infringement of our Sapphire Trade Mark – View Orders. An order was subsequently made that Sapphire Systems was required to pay us $20,000 and also our costs incurred in the proceedings. Our company was delighted to have its concerns of unauthorised infringement of its intellectual property rights vindicated in such a fulsome way. MRP functionality is included in the SapphireOne ERP system. SapphireOne MRP Functionality will dramatically benefit Production Planning and Inventory Control. In Autumn 2017, SapphireOne releases a single consolidated bill system named periodic Invoice inside Sapphire and SapphireOne Software suite that simplifies invoice and payment processes. SapphireOne Periodic Invoice aims to gain operational efficiencies through an improved consolidated invoicing system. Sapphire and SapphireOne added a new function to support Wine Equalisation Tax (WET) for wine manufacturers. SapphireOne introduces PDF capture as a new functionality in Sapphire and SapphireOne software suite to improves data accuracy and eliminates the need for manual keying. Click to view the Press Release for this new features. SapphireOne’s Project Accounting Software feature ensures us to handle a large number of projects and manage financial responsibility by comparing expenses to project costings. Attendees at the 2015 Sapphire and SapphireOne Launch day. The new features and functions are demonstrated on SapphireOne Launch day every year. Attendees at the 2013 Sapphire and SapphireOne Launch day. SapphireOne released an integrated Sapphire WebStore, providing real time updates between back-office and website activities. Sapphire and SapphireOne enhances integrated POS in conjunction with a Web based POS release. SapphireOne deploys the Sapphire Web Pack allowing users to access and update SapphireOne data files in real-time from any browser enabled device. Alicia Parker from ‘Parkers Organic Juices’ has started using SapphireOne. Read her testimonial. Sapphire and SapphireOne integrates with VoIP technology enabling access to soft-phone capabilities and providing clients with a powerful CRM tool. Don Nichols from Team Digital started using SapphireOne. Read his testimonial. Steve Schott from Newkem Australia Pty Ltd started using SapphireOne. Read his testimonial. SapphireOne in Australian Macworld on the front cover. SapphireOne profile from Business Software Guide 2004-2005. Business software guide is a chartered accountants guide to 60 tailored business software solutions. The Company Logo changed in 2003 until today. Every field can be reported on, sorted, queried and searched. Ability to analyse and report on any aspect of your operations. In 2001 we introduced the client server as SapphireOne. The Key to unlocking your BAS. Let Sapphire take care of your accounting system. Michael Radivojevic from Moyle Bendale Timber started using Sapphire. Read his testimonial. Sapphire in BPR news – Click to view. Click to view Sapphire Software Pty Ltd from Accounting Software in New Zealand, product and service listing article – 1997. Sapphire CEO John Adams (back row far left – marked as blue circle) with his growing group of Clients. Front row second from the left (marked as green circle) Paul Beard, CIO of Sapphire and James Brown front row forth from the right (marked as yellow circle), Bordo International: read his testimonial. Managing inventory was my main concern. With the movement of products around Europe it’s imperative we have tight controls and access to key real-time data. Sapphire appeared in CPA’s guide to Accounting Software. Sapphire in MacUser magazine 1994 – A program that does for Accounting what apple did for computing. Sapphire news in summer MacUser 1994 and other places – Industrial strength accounting system are available for the Mac. Sapphire appeared in the book of Apple computer Australia Pty Ltd, Accounting solutions on the Macintosh. 1986 Sapphire is launched. Sapphire is launched and is the first ERP application to work on both Mac and Windows platforms simultaneously. Sapphire and SapphireOne are platform independent, working equally well on both Mac and Windows simultaneously. Sapphire and SapphireOne integrate with VoIP telephony. Wherever there’s a phone number on a application screen, there’s a green icon that can be used to call the contact using soft-phone technology. Sapphire offers web access, allowing data to be entered or retrieved from any browser touchpoint including smartphones, tablets and iOS. Sapphire and SapphireOne are true multi-company, housing unlimited companies, currencies and tax realms within the one data file. SapphireOne client server leverages off the database backend, providing unlimited numbers of concurrent users with real-time access and, optimal processing speeds with no data file size restrictions. Sapphire and SapphireOne provides system wide Document Management (DMS). Many ERPs on the market today deploy a single functional system and interface it with bolt on modules. This can become expensive to implement in the long term as each individual module attracts its own costs and licensing. SapphireOne is all-inclusive, providing access to every module via a single toolbar which includes – Accounts, Inventory, Job Projects, Assets Management, Payroll/HR, Management, Utilities and Workbook. SapphireOne is one of the most unique Accounting Software that is currently available in the market place. What makes it so unique is its ability to remove the mystery of Accounting and to replace that mystique with the practicality of the day to day operation of running your business. SapphireOne is a live work in progress. 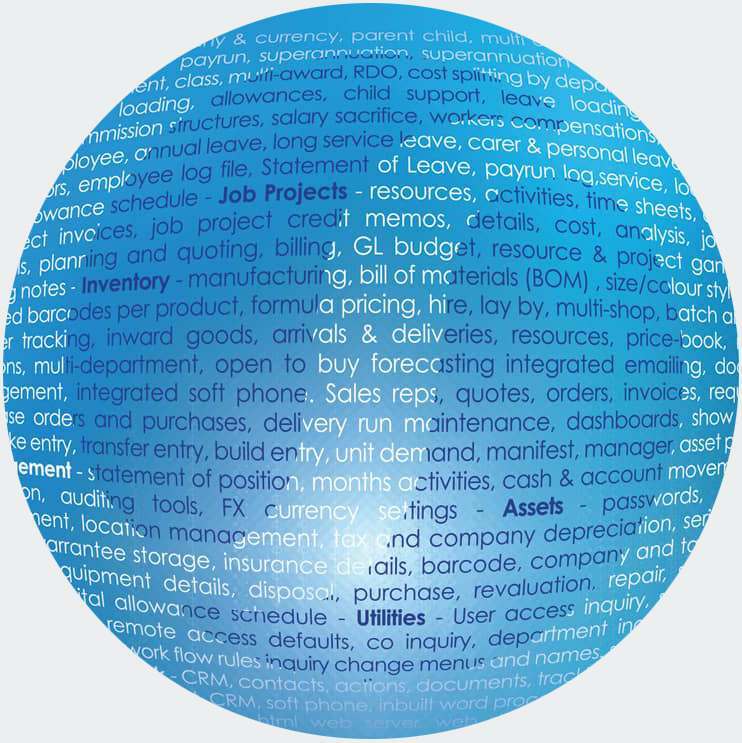 SapphireOne has been developed in accordance with International Accounting Standards and meets all requirements.